Jaywalkers may be fined $25 for a first offense, $50 for a second offense and $100 for a third or subsequent offense. The proposal calls for new and increased fines for pedestrians who violate the jaywalking law and are using mobile devices or earphones. Using a mobile device will increase the fine to $50 for a first offense, $100 for a second offense and $200 for a third or subsequent offense. Massachusetts is not the only state considering action. In New York, the State Assembly passed a law for New York City to study the problem. As of last month, the City of Honolulu began ticketing pedestrians who are texting or reading from a cell phone. The price? Up to $99 per violation. While pedestrian texting bans are new, 47 states and Washington D.C. now have laws which ban texting while driving. Puerto Rico, Guam and the U.S. Virgin Islands also have bans. Massachusetts passed its texting while driving ban in 2010. This is a controversial topic. We will be among those watching the State House this week. Traffic Detour Apps. 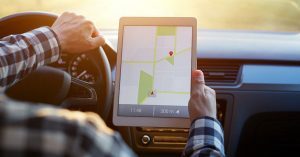 WBZ reported on Monday that drivers are continuing to make use of apps such as Waze and Google Maps, which help them find the shortest route (Note: Waze was actually acquired by Google in 2013). But regardless of the specific brand name, police departments say these apps are a safety issue because they change traffic flow and draw large amounts of traffic to residential roads. Now cities, such as Medford, Cambridge, Brookline and Belmont have taken action, by closing off roads or posting no turn signs. In October, Medford Police announced Bracket Street at Elm Street is residents only on weekdays from 7 a.m. to 9 a.m. and 4 p.m. to 6 p.m.
Belmont has installed no right turn signs off Brighton Street. Brookline has restricted access to several roads off Clyde Street. In Cambridge, Fresh Pond Parkway is also closed to through traffic. These are two stories for every commuter to follow. We will write more about both topics in the weeks and months to come. The Boston car accident attorneys at Breakstone, White & Gluck have over 100 years combined experience representing pedestrians, cyclists, drivers and passengers who have been injured by negligent drivers. If you or a loved one has been injured, learn your rights for seeking compensation. After a car accident, you may incur medical expenses, have to take time off from work and no one can predict how long recovery will take. For these reasons, it is important to contact an experienced Boston car accident lawyer.